To add yourself to the voucher list of one of our magazine titles, please register your details by clicking the button below. Pictured centre left is Macio Miszewski of Van der Merwe – Miszewski Architects and Rick Brown of Rick Brown and Associates who received the award for the No. 1 Silo: Allan Gray Headquarters in Cape Town. They are pictured with (left) Mziwonke Dlabantu, Director General of the National Department of Public Works who was also the key note speaker at the event and (right) Sindile Ngonyama, President of the South African Institute of Architects. The movers and shakers of the architectural world in South Africa gathered at Shine Studios in Braamfontein on 2 September to witness the presentation of the 2015/2016 Corobrik SAIA Awards of Merit for Excellence in Architecture to the cream of the profession. 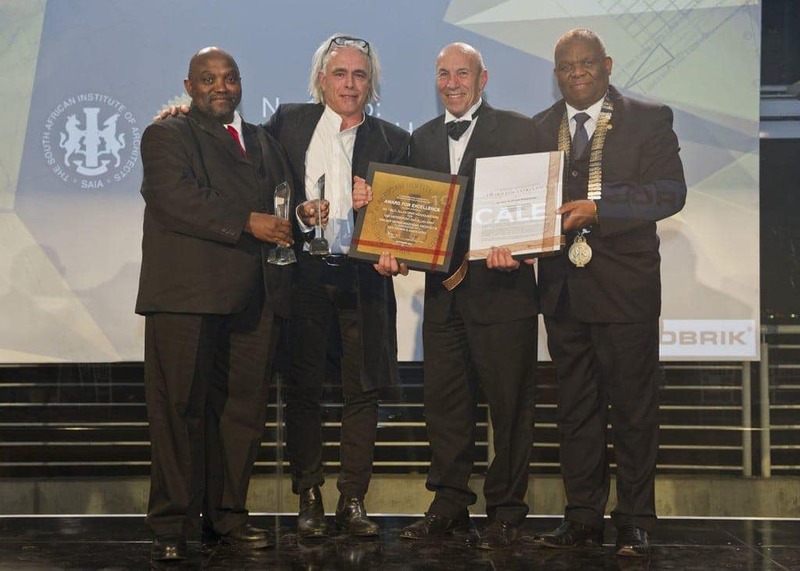 The seven best designs and a book earned Awards of Excellence – the highest accolade to be given to an architectural project in South Africa since the inception of the programme in 1990. A further seven projects received Awards of Merit, which were first instituted in 1999 to recognise good design or a substantial achievement in the industry. In addition, 16 commendations were awarded for remarkable design. According to Kevin Bingham, awards convenor and SAIA Vice President, the large number of awards and commendations this year bore testimony to the high quality of the entries. The eight winners of the Awards of Excellence were House La Lucia, Durban submitted by designworkshop : sa; the Military Health Base Depot in Tshwane designed by Jeremie Malan Architects; House van der Watt in Waterkloof, Tshwane entered by Slee & Co Architects; House Pretorius, Cape Town put forward by Metropolis; 17 Glen Avenue, Cape Town designed by Seali Mahoney; Krynauw Nel Associates’ design of the ‘Malapa’ Fossil Cave & Visitors Centre at the Cradle of Humankind in Gauteng; Number 1 Silo: Alan Gray headquarters at the V&A Waterfront in Cape Town submitted by Van der Merwe Miszewski Architects in association with Rick Brown Associates; and a book, Eclectic ZA Wilhelmiens, submitted by Fisher & Clarke. This year’s judging panel was headed by Bingham, who is also a director of FGG Architects in Durban; and included sponsor representative Musa Shangase, who is commercial director of Corobrik; Mokena Makeka, who is founder and principal architect at Makeka Design Lab in Cape Town; Prof Paul Kotze, who is professor of Wits University’s School of Architecture and Planning; and eminent layperson Sumien Brink, who is editor of VISI magazine in Johannesburg. Musa Shangase of Corobrik said that the developing rainbow nation that was South Africa presented unique challenges for the architectural profession which in turn offered opportunities for thinking out of the box and for innovative and unconventional solutions. “Limited budgets, which often apply to public buildings that need to meet a variety of needs, can act as a catalyst for great design which is fit for purpose and complimentary to the landscape,” he said. The keynote address at the awards dinner was given by Mr Mziwonke Dlabantu, Director General of the National Department of Public Works. The Corobrik-SAIA Awards are presented on a two-year cycle and are open to SAIA members from all of its regions nationwide who are invited to submit entries for their best work of any kind. Regional awards are presented in the first year of the cycle and national awards in the second year.